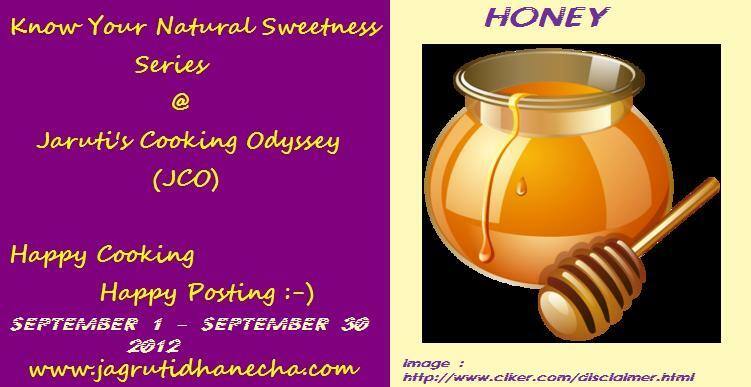 Happy to Guest Host Jagruthi's KNOW YOUR NATURAL SWEETNESS EVENT - HONEY for the month of September. .
1) Cook any recipe with Honey as the main or one of the ingredient . 2) Both Vegetarian and Non-Vegetarian Recipes are allowed. 3) Archieved entries will be accepted , only if they are re-posted with the logo and event link . 4) Multiple recipes can be submitted . 5) Non-bloggers can mail me your recipes to shamanagscrafts@gmail.com. 6) Use of logo and link pages of the event by me and Jagruthi is a must. You can link in your recipes here in the link provided . Happy hosting :) Im hosting this series next month !! Very nice event. Will send my entried soon. Happy hosting dear. Hi Shama, linked four juice and smoothie recipes to your event. Please check dear. FAST FOOD EVENT - NOODLES ROUND UP!! !